How do I start this post? How do I convey to everyone reading this how much I appreciate your your comments, emails, texts, and Facebook messages in response to last week’s post? I don’t think words can ever describe how grateful I am for the amazing support and encouragement that I have received in the last week. But cookies can. I’m better with cookies than with words. 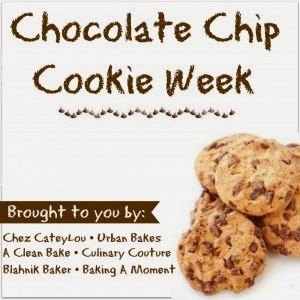 Lucky for me, it is National Chocolatee Chip Cookie Week, and I was invited to contribute to a virtual Chocolate Chip Cookie party with some of my favorite bloggers. Every day, one of us shares a different recipe (If you follow on Facebook, this is probably old news!) 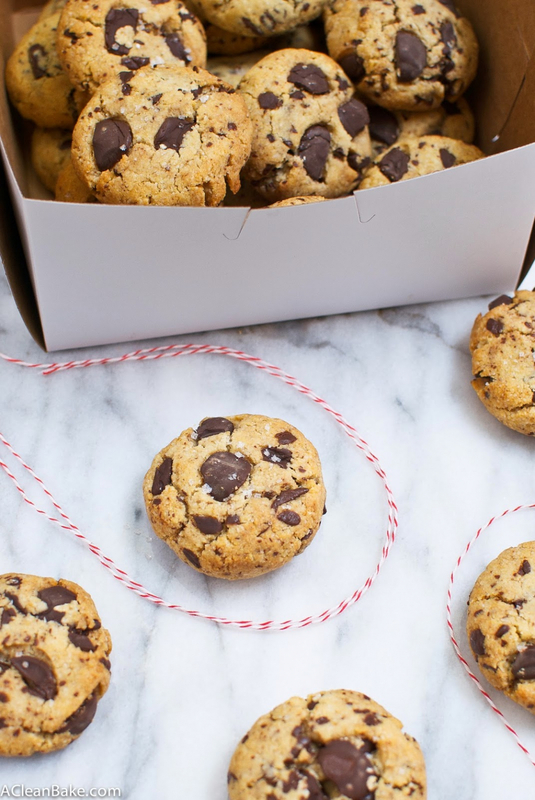 and with all the creative and delicious recipes this group has to offer, I thought what better time to share my absolute favorite new chocolate chip cookie recipe? 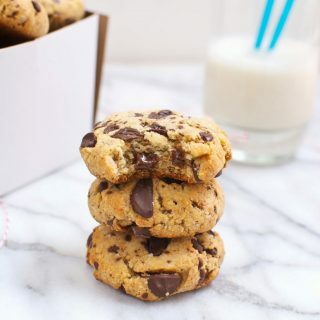 I have been working on this chocolate chip cookie recipe for months now – basically since I went on this crazy eating plan and, at the beginning, I wasn’t able to eat almost any grains without getting a terrible stomach ache. The worst part was the withdrawal from that feeling of taking the first moist, chewy, salty-sweet, chocolatey bite of a freshly baked chocolate chip cookie. It took about 231902831 batches, but it was worth it. These are the best grain-free chocolate chip cookies you’ll ever eat, and if you’re like some of the people who tasted these, you probably won’t even realize they don’t contain any wheat. The trick is to use the right almond flour; the finer the better. I tested these with two brands: Wellbee and Honeyville, and both worked like a charm because they are extremely finely ground. Almond flour, in case you aren’t familiar with this ingredient, is simply made from whole blanched almonds that are ground up (it is sometimes labeled almond meal). The finer the grind, the better the flour can hold fats (moisture) and mimic regular wheat flour. I would not advise using a courser ground brand, like Trader Joe’s almond meal, if you can help it. But if the Trader Joe’s stuff is all you have, use it (maybe just process it in the food processor to get it a little finer). Because you can’t miss out on these. Fresh out of the oven they are crispy on the outside and soft and gooey on the inside, exactly how a perfect chocolate chipper should be. Storing them overnight in an airtight container lets the moisture redistribute, yielding an even softer little blob of chocolatey goodness the next day. The few days after they are baked, they taste just like they rolled out of the Keebler Soft-Batch factory, but they are lower in sugar and carbs, grain-free, lactose-free, Paleo (if you’re in to that sort of thing), and not only easy on the tummy, but will make your tummy very, very happy. 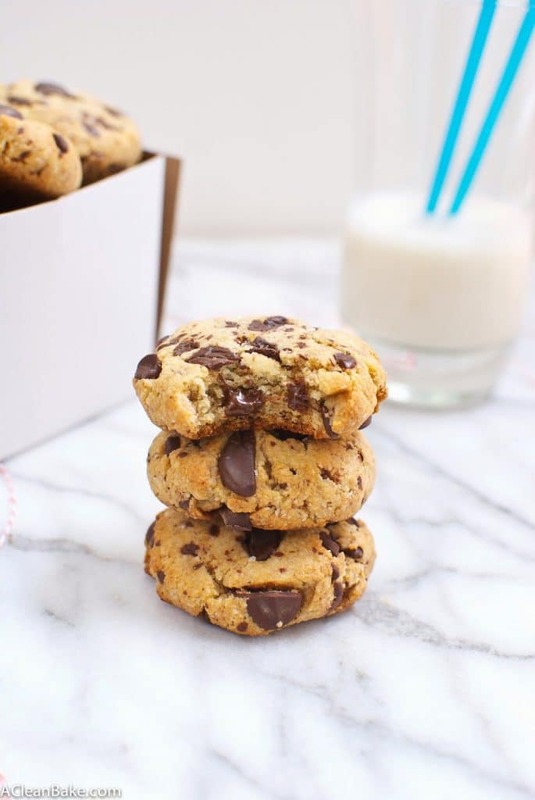 PERFECT thick and soft grain-free chocolate chip cookies - you can't miss these! Preheat the oven to 350F and cover a cookie sheet with parchment paper or a nonstick pad. Add the flours, sugar, salt and baking soda to a large mixing bowl. Use a fork or whisk and stir gently until combined. In a separate, heat proof bowl, pour the warm melted coconut oil over the honey. This will soften the honey and make it easier to work with. Stir briefly, then add the oil/honey mixture, egg and vanilla to the dry ingredients. Use an electric mixer if possible, or else stir vigorously with a whisk or fork, to make sure all of the wet ingredients are distributed equally throughout the dry ingredients. Scoop heaping Tablespoons of dough and press firmly into a ball. Press down slightly into a thick disc and repeat with the rest of the dough. Place 6-8 dough discs on a cookie sheet, leaving at least 2" between each to allow for a bit of spreading. Bake 9-11 minutes, until golden brown around the base. They will still be very soft. Allow to cool for 5-10 minutes on the cookie sheet, where they will firm up a bit, before transferring to a rack to cool completely. Be gentle, as they will still be soft! Serve immediately, or store in an airtight container at room temperature for up to a week (if they last that long), or in the freezer for up to three months. For larger cookies, scoop 3 Tablespoon portions and bake for about 13 minutes. Yield: 15 small cookies or 8 large cookies. Meriem is in charge of Wednesday’s Cookie and boy does her Chocolate Chip Paradise Pie put my simple little CCC’s to shame! 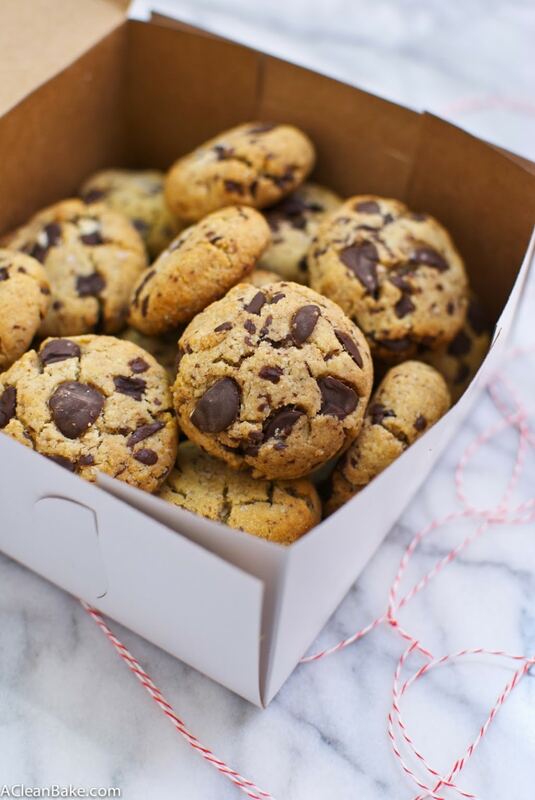 Happy Chocolate Chip Cookie Week, everyone! Yum these cookies look amazing! And I can’t believe they’re grain free! Pinned! Thanks for pinning, Christina! Wait until you taste them. You won’t be able to tell they are made with almond flour! Made them today and they are gorgeous!!! Wonderful! Thank you so much for letting me know; you made my day! Enjoy your cookies! I am completely crazy about these cookies – made them several times (about 7 times). 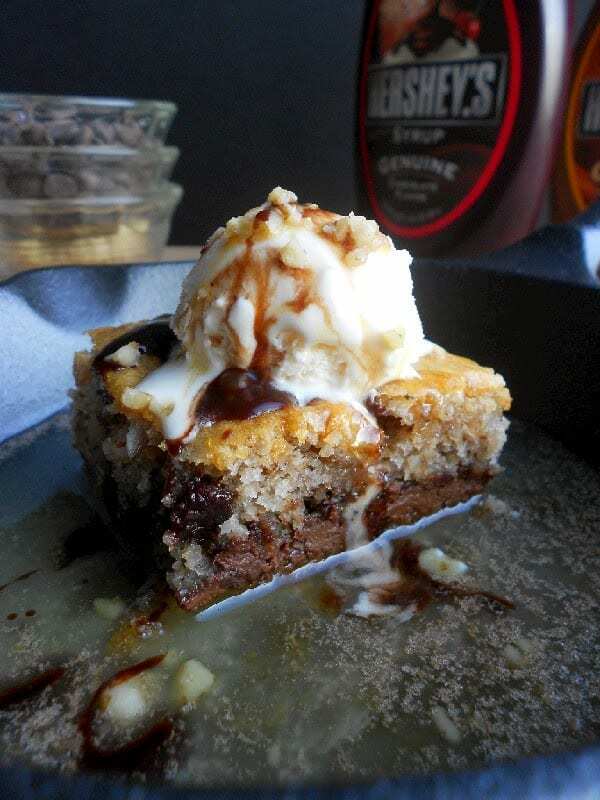 I made these last week and they were a huge hit! I have my second batch in the oven… Sooo delicious!!!! These were delicious! Thanks for sharing! Hooray! So glad you liked them, Miriam! I was experimenting in the kitchen once, and I discovered that adding coconut flour made for very soft cookies! I loved it! Thanks for making and sharing these! I’m always so excited to see how these recipes turn out in others’ kitchens! Hi, these look amazing! Can I substitute coconut sugar instead of the stevia? Yes! You may need to increase baking time by a couple of minutes. And you may want to use a little more coconut sugar than the recipe calls for stevia, since stevia is slightly sweeter. I hope you enjoy these cookies! I like my cookies crunchy, what can should I use instead? I’m sorry, but there is no easy way to make these crunchy. I am working on a crunchy chocolate chip cookie recipe, so stay tuned!